everything that i used for rose's face... the oil pastel is a cream caran d'ache neopastel. Lynne, you are on a roll! So much with so little, you are right on...i need to remind myself of this right now. In other words sometimes, less is more, right? She's beautiful and ethereal- I love Rose.
. . . smack in the middle of her gorgeous face! Beauty is important, yes, but knowledge is a very powerful thing. Now that I'm looking closer, there are a few more interesting words tucked away on this piece. . . nice! 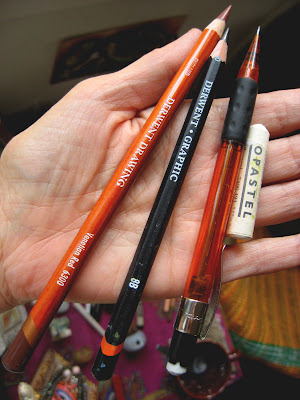 I have the same Derwent pencils, so I know why you love them!! and I love seeing how you use yours Lynne ! i love the subtlety of rose. Rose make me remember a time of removing wall paper in an old farmhouse I lived in. 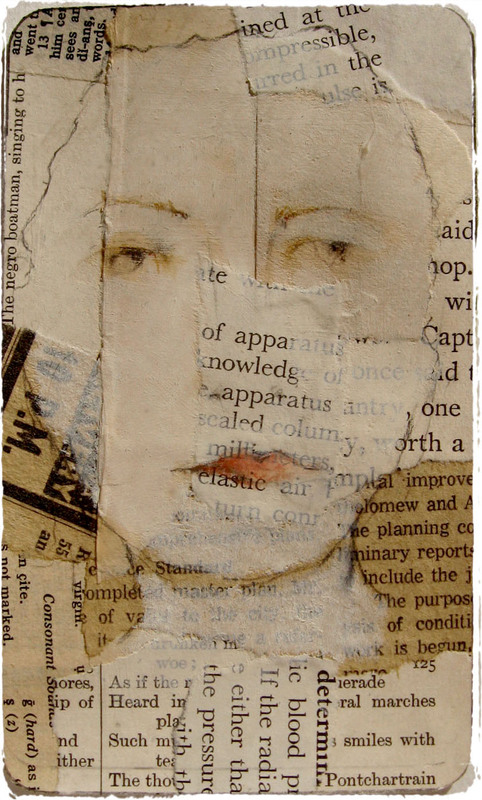 We peeled back layers and layers of paper and the bottom layer was newspaper - I can just imagine her as one of the first inhabitants of that old house . 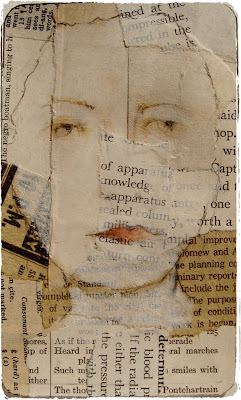 . . what fun it would have been to discover her . . .
And I love my Derwent pencils too! Simply beautiful...and I love that you only used those three pencils and your oil pastel crayon. Beautiful...fading. My mothers name was Rose too (Rose Rita)... a special person, just like your Rose. Aaaghhhh... a new pencil. You know I am a collector of pencils. Adore the creaminess of the prisma colours Lynne. Hello and love to your Creator too. You do magical things with those tools you hold in your hand. To have one for every place you might sit is a very good idea. so so wonderful Lynne, even I am lately not very often in the blogger world.... whenever I come back , I am coming to check your new work :) thank you Lynne !!! I always think of the Author, Ann Tyler when I come here, I didn't even realize till a bit ago I do that. I think of the books, the Accidental Tourist, Saint, Maybe, Dinner At the Homesick Resturant and many more. To me her writing and your art make me feel the same. Even her photo in the backof her book makes me think of you. emilie, i have only seen the movie 'the accidental tourist', and it is one of my favorites. i'll check out ann tyler's books... but yes, i can see (just from the movie) how this would be the case. Oh what a beautiful series of faces! Inspiring as always! Thank you also for sharing what you use to make them. Such a beautiful piece Lynne! A new favourite for sure.